While the car's might not be all here yet the brochure for the Canadian model of the 2008 smart car is and its well worth a read. Even though the American version will have a few different options most of the things are the same in terms of the engine spec and style. 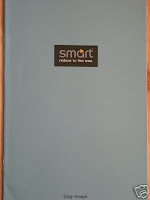 Smart USA hasn't released a brochure yet and I would think part of the delay is that some parts the US smart is getting are actually exclusive to the US and smart hasn't had time to get this all printed. Canada basically used the same brochure that the UK smart had for 2007. This brochure has a great list of optional accessories also. For me I bought my smart long before the brochure and took in good faith that I ordered the right parts and it turned out the only part I didn't order (rev/clock pods) can be dealer/self installed in less then 30 minutes. A little side story about me and my personal love for the smart. It all started in 1999 in Austria as I was touring all over the world and ended in Austria for a few days. 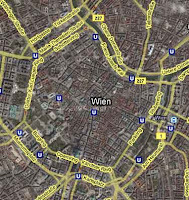 The main center in Vienna has a ring road that goes around it and on that ring road are a few highend car dealers, Ferrari, Porches and this one dealership I'd never heard of before "smart" which had some interesting cars inside. I went in and it was love at first site, I had calls into the bankers that afternoon to see about buying one and how to get it home, which at that point was Switzerland. I never did end up getting the car, but I did get the brochure and had that thing for years, recently thanks to the power of eBay I've rebought a mint conduction version of that 1998 brochure and boy does it bring back memories. What I am getting at is I hope that this brochure can start a few people on their way to owning a smart, it might take 10 years like it did me but in the end it will be well worth the wait.